Inspired by conversations on the FOOD52 Hotline, we're sharing tips and tricks that make navigating all of our kitchens easier and more fun. Today, Merrill shares her favorite way to make a sunny-side up egg. We may have covered all the egg-frying bases last week, but we can't stop talking about eggs. Can you blame us? A perfectly cooked egg is an incredible thing. So we're keeping the conversation going. Today, Merrill's showing us her favorite way to make a sunny-side up egg. (Hint: with both butter and olive oil.) Let us know your own methods in the comments! I used neutral flavor coconut oil (so healthy) and the eggs are the best eggs I have ever eaten. Perfect. The white was completely done and the yolk was deliciously yummy! why are you adding meaningless work, not to mention calories, and a waste of oil to a sunnyside up egg? Put a teaspoon of water in the lid of your pan turn it over and turn off the heat. Wait about 1 min for runny yolk, done but not rubbery whites, and that's it, voila! You still have a perfect 80 calorie egg. Thank goodness this is America and we can all have our own opinion. I like the taste of bacon and the bottom of my eggs crisp. The white is always done and the yolk is always runny the way I cook them and I've been doing it that way for 50 years. If you like them over easy or basted go for it. My sunny sides are awesome and everyone loves them. Haven't had a complaint yet. I don't object to oils, whether it is butter, oil, bacon fat or even cooking the egg with none of the above. What I do mind is an egg where the white is still transparent and runny and you can still see the placenta! As in the photo! The perfect egg is with a white that is opaque and solid but NOT CRISP, and the yolk is wonderfully runny. You can accomplish that best by turning it over very briefly. You can also manage it if you baste it with something hot without turning, but, it takes longer and risks overcooking the bottom. Fried eggs will not absorb fat. It is only a means of getting to your finished product. Eggs can be cooked in any kind of liquid from oil to water or even broth. Drippings give your eggs the best flavor. The grease will only be on the outside of the egg. Too much for you, set the egg on a paper towel and it will absorb most all the grease. If you like bland eggs you might as well just poach them. Myself I like that good ol manly bacon flavor. Cook a pound of bacon leaving all the drippings in the pan. Have heat on medium high. Just as it starts to smoke crack in your egg. Use your spatula to splash drippings on the whites first and then the yoke. Eggs are done in about 1 minute. Nice crispy bottom with a great runny yoke. Mmmmm! In my opinion the best way to make a sunny side up egg was the way my Dad made them. He'd take the eggs out of the frig an hour before cooking or the night before (if it's not hot in your house) and make it with a T. of butter. Voila!. Taking it out before cooking makes sure that the yolk isn't cold when the egg is done. Perfect sun, perfect white. You need to use that much fat in order to be able to spoon it over the egg to cook the white properly, but very little of the fat is actually absorbed by the egg. As you can see in the video, there is still plenty of oil left in the pan to cook a few more eggs -- no need to add more if you're making eggs for a group. too much oil, that's enough oil to fry two potatoes and onions. Unnecessary amount of fats. A little oil or butter & cover with 1Tb water is much better & healthier - even less work! Yes, you can do it that way, but your results will be different -- you will have a steamed egg rather than a true sunny-side-up egg. I never thought I would say this. Food52 is my go to site, the place I look first for recipes and technique but.... Ewwww. I'm not afraid of butter or oil but that just looked slimy. Sorry Merrill. To each their own. I prefer to think of it as "glistening." It's actually nice and crisp on the edges. Too much oil and butter; I'm another one who adds water and covers. Works great. If you like your eggs so bland you should just go ahead and poach them! This is a ‘naked’ Fried (& Steamed) sunny-side up egg method using the stove-top. In a pre-heated (when a sprinkle of water bubble’s and evaporate’ s) non-stick pan (I use Ceramic Titanium) add egg(s) and wait until the white sets, a few minutes, depending on heat level preferred. Add small amount of water to hot pan with egg(s) and cover with lid (my lid is clear). The water steams the egg(s) in this final cooking stage. Wait a few more minutes until yolk is cooked to desired doneness. Season as you wish (I use pepper). This is similar to the previously posted Oven (!) method from Saltie: A Cookbook, but only uses a stove-top. B-t-w, I use a stove-top/oven method for meat proteins. I like this. But don't you get that unpleasant flavor on a no-stick pan without any fat at all? I use butter only for my sunny-side up eggs, Just as the bottom of the egg looks like it would be ready to flip for over-easy, I add a tablespoon of water to the pan and cover the pan for for about 20 seconds or so. This steams the top of the egg perfectly and I have a nice, runny, sunny-side up egg. Works perfectly every time. Another BIG thing is the quality of eggs you have. Farm fresh, free range and organic eggs are naturally heavier than conventional store bought eggs. They tend to stick more because the yolks are much heavier with a totally different consistency. I saw this method from a video by Jose Andres, it looks wonderful but that is a lot of oil. Eggs are probably the most annoying thing for me to cook. I make up to a dozen eggs in a day for my family. To stretch a buck I save fat from bacon, homemade stocks and whatever drippings I have. I use this with my cast iron skillet and pray for good results! I think my biggest issue is patience... I don't have very much. 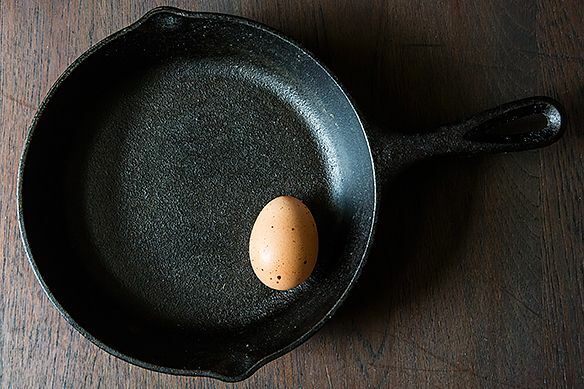 I don't own any "regular pans" I will have to try this in my cast iron!